In this stage you will provide some information about you and your company, do some initial costing and estimating, and learn about Opendesk content requirements. Establishing price - You’ll use our typical quoting form to prepare an estimate for a Studio Desk. 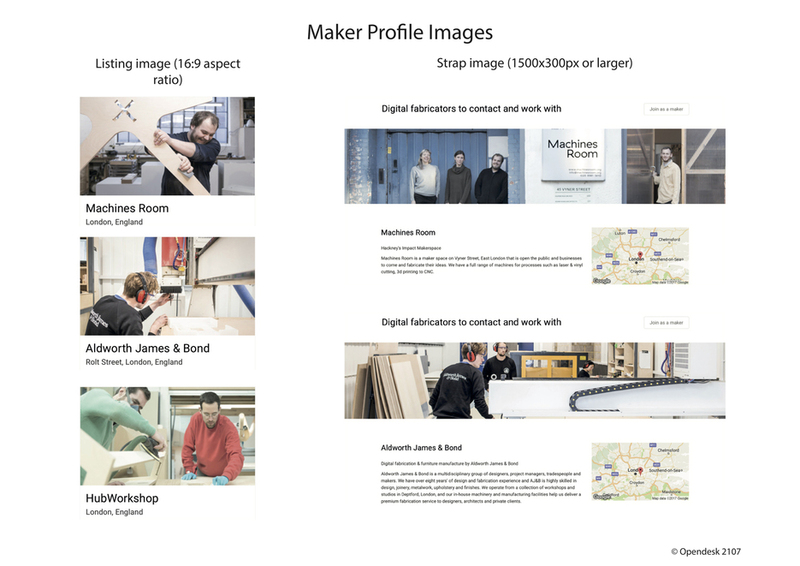 Content guidelines - You’ll become familiar with our guidelines on production of profile photography, you will use these guidelines for Stage 3 and for future Opendesk jobs. In order for Opendesk to continue developing and improving the platform, it’s important that we understand you and your business well. In this way we can be sure that what we are developing is right for you. Please click the button below to be directed to a short form requesting key information. When Opendesk receives an enquiry from a customer, we reach out to three makers local to them for a manufacturing cost, delivery cost, and lead time. We do this by providing the DXF file, assembly instructions, and a shared Google Sheet for you to input the details of the quote into. Below is a link to download the required assets to quote on a Studio Desk - one of our most popular designs. Click below to download the dxf and instructions and provide us with estimated timings and rates in the quoting spreadsheet. You will use these to compare against the actual times you achieve in Stage 3. In order to “Hero” you as a maker, we need customers to be able to understand who you are and what makes you unique. To do this we need good content to show, this covers photography, text, and video. We’re looking for great photos that will make you stand out from the other makers around you. At a minimum we need two images for your profile, a listing image and a strap image. They should be good quality and show a bit about your team, workshop, processes etc. You can use the below as a reference. We suggest taking the photography as you move through Stage 3 so you have some great content of you fabricating the Studio Desk.